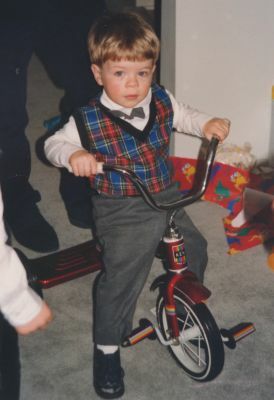 From an early age I loved riding bicycles. Growing up, we lived in a quiet neighbourhood at the end of a court. Even before I learned to ride without training wheels I loved riding my bike around in circles on that court. I would go out and ride almost every night during the summer. As I grew older, I continued to enjoy going out for bike rides around the neighbourhood. When I was 10 I participated in a mountain biking group ride with my Cub Scouts group. The ride was held at Durham Forest, a conservation area about 20km north of where we lived. My dad participated in the ride as well, and both of us really took to mountain biking right away. Durham Forest has by far the best cross-country mountain biking trails in our area. For the next decade, my dad and I would go riding at Durham Forest almost every weekend during the summer months. When I was 17, my mom discovered that Lakeridge Resort, our local ski hill, was offering a mountain biking summer day camp for kids. The previous year I had spent a month working as a counsellor in training at another camp. With all of my experience riding at Durham Forest combined with my experience working with children, I was wondering if Lakeridge had a job opening that I could apply to. They didn’t have any positions posted but I submitted my resume and cover letter anyway. Amazingly, they gave me a call almost immediately! I worked at the camp full time during the next two summers teaching and supervising mountain biking for children. Part of the job also included inspecting and doing repairs and maintenance on the camp’s fleet of bikes every morning. All in all, it was a really fun and rewarding summer job! When I started university, I brought an old bike with me for getting around campus. There really wasn’t very much opportunity for mountain biking during my university years because school work kept me quite busy, and most of the time I didn’t have a secure place for storing my mountain bike. During my second summer of university, I started to get interested in road biking. I was living in Waterloo for the summer, and the country roads surrounding the city are really well-suited for road biking. I managed to find an old road bike quite inexpensively. The bike is a 1984 Supercycle Excalibre and I paid only $25 for it! After a basic tune up, the bike worked wonderfully and I was able to do a long ride in the country almost every weekend that summer. In fact, I have been so satisfied with that bike that several years later I still haven't upgraded to a higher end road bike. It has certainly traveled a lot of distance under my ownership. Throughout university I began using bikes as my primary mode of transportation. On my second co-op workterm, I was living and working in the northwest corner of Mississauga (January to April 2009). I had been hoping to find a place to live that was within walking distance of my office, but the closest place I could find that suited me was over 5km away. For the first month and a half I took the bus to work. If I were to have walked, it would have taken about an hour each way. 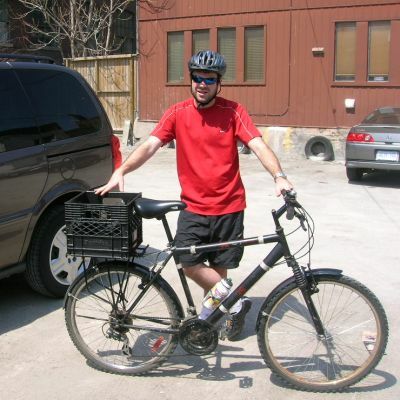 Since I knew I was going to be living there during the winter months, I never imagined that biking was a realistic option for getting to work regularly, especially with the busy Mississauga roads. Soon after moving to the area however, I discovered that there is an incredible network of multi-use paved off-road trails through that part of the city. These pathways are continuous throughout the different subdivision, and include several underpass and overpass bridges across the major roads. This makes for an incredibly bike friendly and pedestrian friendly neighbourhood, where you can travel long distances without having any interaction with vehicular traffic. In mid-February there was a week of warm weather which melted most of the snow. I saw this as a perfect opportunity to investigate the trail network. I was able to find a route for riding to work which utilized the multi-use trails for about 60% of the distance. For the remainder of the route I had no choice but to use the sidewalk on Derry road. Being able to ride to work, especially during the winter, was a really great feeling! I rode to work every day during that week and after it started getting cold again, I just kept on riding! I experimented a lot with different clothing options during that first winter. There was still a lot more snow that came later in the winter, but the city did a great job of keeping the multi-use trails clear. Ever since then I've been fully committed to year-round bicycle commuting. In southern Ontario, there are very few days when biking isn't realistically possible. 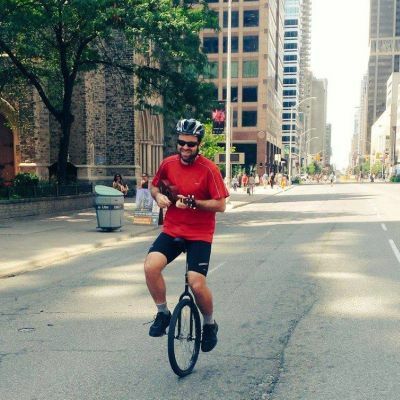 During that workterm in Mississauga, I also developed an interest in unicycles. Many years earlier I had tried a friend’s unicycle and found it absolutely impossible to ride! However, people who know how to ride them make it look easy. Since then, I always wanted to be one of those people and I knew that it was just a matter of investing the time to develop the skill. In mid-March, the weather outside was really warming up and I loved being outside exploring the multi-use trail network. I realized that this location would be perfect for learning how to ride a unicyle so I researched them. I managed to find a bike shop that had a few for sale, so I bought my 24” unicycle. The first day was pretty tricky, but by the end of the second night I was starting to get the hang of it. The third day was a Saturday, and I woke up early to go and ride. By the afternoon I had the skill of riding forwards completely mastered and I was already exploring all over the multi-use trail network. The place where I first mastered the skill was actually on top of one of the multi-use overpass bridges because it had a hand rail which was at the perfect height. In the fall of that year, I mastered the skill of riding my unicycle while playing ukulele and singing. Unicycling is still a fun hobby that I enjoy doing from time to time. I still haven't learned how to do very much other than riding forwards, but I enjoy seeing the looks on people's faces when they see me go riding past. In my post university life, I live in Toronto and I'm able to get to just about every part of the city on my bike. My bike is my primary mode of transportation for getting to work and running errands. I currently have two bikes which I use regularly for commuting: my Raleigh Sport and my Green Machine 2. Both bikes have a plastic milkcrate mounted on the back for carrying cargo. I find this cargo system very useful because it's extremely versatile. I'm able to fit many items inside the crate, and larger items can be easily strapped to the top or sides using bungy cords. Milk crates are also great because you can stack many of them on top of each other for extra storage space.